The holidays are the time for sharing sweet treats with others. And just because you are invited to a cookie swap, doesn’t mean you have to bring a cookie that is full of sugar, butter, fat and calories with the group. How about trying a cookie like this? 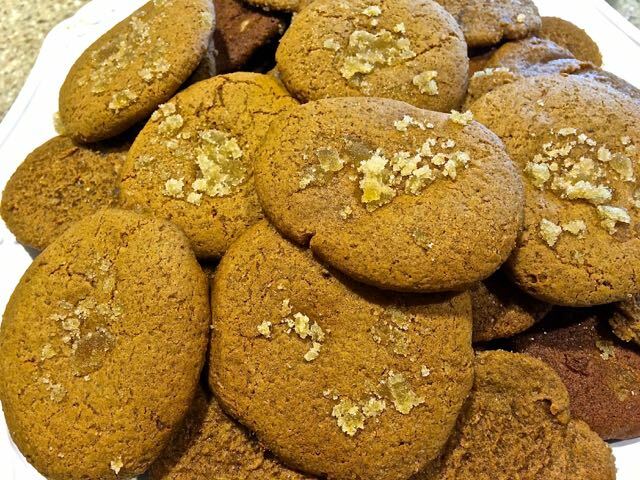 Granted, not health food, but a little-better-for-you, due to the reduced butter, less sugar and the wonderful spicy ginger that makes these cookies sing with flavor! Ginger is helpful in eliminating gastrointestinal distress. In a recent double-blind study, ginger was shown to be far superior to Dramamine for motion sickness! We use it a lot in our cancer fighting kitchen for nausea during chemotherapy treatment. Ginger is also a anti-inflammatory because of compounds called gingerols. These substances are believed to explain why so many people with osteoarthritis or rheumatoid arthritis experience reductions in their pain levels and improvements in their mobility when they consume ginger regularly. Remember it’s all about portion control when consuming cookies (2 cookies / serving for these) but rest assured, you are getting some health benefits from the ones below. Beat the butter with a hand mixer until fluffy. Add the 2/3 cup sugar, beating well and molasses and egg – beat well. Combine the flour, soda and spices, (except for the crystallized ginger-sugar mixture), together in a bowl. Add the flour mixture to the butter mixture, and stir until well blended. Divide the dough in half, wrap and freeze for 30 minutes. While the dough is freezing, preheat the oven to 350F. Prepare 3 sheet trays with parchment paper. Remove the dough from the freezer and create about 24 (1 inch balls) Roll the balls in the crystallized ginger mixture and flatten the cookies with a glass to ½ inch. Bake for about 10 – 12 minutes or until lightly browned. Cool completely on wire racks.